The Safe Mac » Announcing AdMedic! Update: AdMedic has been renamed, and is now AdwareMedic. For the current AdwareMedic app, go to www.adwaremedic.com. It’s really great that you’re doing this but given your comment about transparency, why not release the source on to github (say) so that it can be audited? It’s not necessary for everyone to be able to understand it but there are plenty of developers who would be able to look at it and vouch for its transparency? Maybe at some point, but at the moment the code could still use a bit of cleaning up and commenting before I’d want anyone seeing it! Besides, this is much less of an issue because of the availability of manual removal instructions. Thank you Thomas for this new app – your work is very much appreciated! Just downloaded AdMedic and it ran without issue and I was pleased to confirm that my Mac is ‘clean’. The Adware Removal Tool itself was of tremendous help to numerous users grappling with the annoyance of adware and being able to point people in the direction of The Safe Mac for a solution is terrific. Excellent question! I put a link to AdMedic in the sidebar, but neglected to put one in the article itself! I’ve corrected that now. Hey Thomas, how do you make a direct download link? I’ve always tried to do that for my website. Thanks for your continued help in a secure mac! of only apps from the Mac App Store and identified developers” problem. Can you post a signed version or provide a workaround? My apologies. I pushed out a bug fix too quickly this morning, and neglected to sign it. This has been fixed, if you download a fresh copy of the app. Hi Thomas! Your work, and the time you have spent on this app., for the benefit of we users is MOST appreciated-many thanks! I like this post. Thomas, thanks for developing the app. Apple has really dropped the ball in terms of adware/malware protection. Just in case anyone is interested, there is a new adware I accidentally discovered called softworld and it is an Amazon.com plugin. I already sent the details to Thomas. And in case people were wondering, no shady sites were visited in the process. I hope this helps everyone. Thank you, thank you! I uninstalled a nasty adware with your app! Very disturbing! You saved my day! I love the App and have used your website so many times, but one of my friends wants the app removed from his computer. by any chance is there any thing I would need to know additional to remove the app off his computer? your website has helped me so much! You can delete that folder as well, if you like, though it doesn’t occupy much space. thank you Thomas Very much!!! you are AWESOME!!! Hi Thomas, Should I delete your TSM Adware Removal tool in place of this new app AdMedic? Also thanks again for you dedication to Mac safety. The future looks like we possibly will have more adware attacks and I feel safer thanks to you new full fledged Application. Yes, this replaces the Adware Removal Tool. It is amazing!!!! i can serf on the net without any annoying adware!!!!!! thank you very much………. Thanks Thomas!!! Many appreciate your work and expertise. You caught me up to speed when I moved to the mac platform a couple of years ago. Thank you for the AdMedic, which I used to remove the Genio files. But in regards to Google Chrome for Mac, when I open that application, the opening page has InstallMac’s logo and searchpoint… as the URL. Any suggestions would be welcomed. Thank you. Thank you very much for all of your work! It is very well appreciated by us all! I was having massive troubles with adware which was likely from pirated movie websites that my brother goes on, and I could hardly open anything without some ad opening in a new tab and youtube was filled with ads. Immediately after I ran your app, I saw results and it made the internet easy to use again. I would highly recommend this and i will use it in the future! I just removed malware from my macbook. It seems to work 🙂 Thanks! This crap has been running on my macbook for several days. How do I know if it stole any passwords or has left any malicious content on my hard drive, as part of an illegal ghost network? Adware on the Mac has never yet been documented to steal passwords or do anything else outright malicious… it just makes a nuisance of itself by shoving ads in your face. You should be fine. When I try to run this app from my application, I am getting following error message. Do you have any kind of outgoing firewall or network security software, like Little Snitch, that might be preventing AdMedic from making an outgoing connection to http://www.thesafemac.com? No, there is no firewall. My firewall is turned off. Anythings else I need to check? This would not be caused by the built-in firewall, this would be due to other third-party software you have installed. Try restarting your computer in safe mode, and see if AdMedic works properly then. No luck in safe mode. I am getting the same error. By the way, I know how to check build in firewall, but how do I check if setting if installed firewall? If you had a third-party firewall installed, it would have been disabled in safe mode. Why don’t you send me an e-mail privately, and I’ll see what else we can do to figure this out. These comments aren’t the most effective way of exchanging messages about this. As I was using office network, it was not allowing me to connect, and it was showing above warnings. I have done it from my home and it worked like a charm. Admedic does it job, before you realise it. Thank you very very much for such a wonderful product and your help. Thank you Thomas! Ad medic worked properly, and for the moment no adware any more. I appreciate your work very much and I will follow your work from now on! This is definitely better than the last version. You don’t need an Admin account to find AdWare. Thanks! i just wanted to say a big THANK YOU and give testimony/witness to the reliability of this software & person who created it. a friend of mine asked for my help today after he let a youngster get on to his Mac without supervision. he apparently downloaded & installed some adware/spyware/maleware(?). suddenly any time he clicked a link in any browser, other tabs/windows would open with advertisements & other websites selling stuff. PLUS, on the Google search results page and on YouTube pages, there were additional ads scattered about (some of which were not appropriate either). i’m pretty tek/Mac-savy & usually figure out issues he has here’n’there, but as i dug in & started researching, i quickly found that there were WAY tooooooo many nefarious files scattered throughout not only his user library, but the whole system. i wasn’t confident that i’d find ALL of them. i tried the free ClamXav, thinking it’d help, but it didn’t. then came across a forum thread (https://discussions.apple.com/thread/5965902) where Thomas offered a link to this app of his. i’m usually VERY leery of such posts as i’ve seen where bad people do worse harm to others in need by offering sites or apps that do even more horrible things. but, after realizing there were too many variants, filenames, & locations to look for, AND after reading a few of the posts of people who tried it & had success, i gave it a shot. what could it hurt – if it didn’t work, i was looking at having to do a clean install anyways (to make sure to eradicate everything bad). 3) it found & let me trash all the bad files!!! 4) and it’s FREE!!! Donationware; NOT nagware. it’s refreshing to see quality software given out with integrity & honor. Yes, I too just downloaded Admedic and it found Geneio and Mackeeper that were hiding on my computer. I had done my own search for these caches and launch agents and couldn’t find them. OK, I think I’m ready for this latest solar flare, yeah right !!! I can’t install it because it isn’t from the Mac Store. 🙁 Is there anything I can do? I keep getting pop ups and ads every single time I click on any links and I am going crazy. I am also extremely computer illiterate, so if you could help me, I would be very grateful. If you control-click the app and choose Open from the menu that pops up, that will let you open it without changing your security settings. Unfortunately, there’s no way for this app to be distributed through the App Store, as it needs to do things that App Store apps aren’t allowed to do. Terrific, Thomas. Best regards from a very chuffed Brit. Hi Thomas… was looking for this after a ‘Mozilla Survey’ page popped up. I found your site and App and installed it. Luckily – the pop was due to a plugin I had running on a site that was incorrectly pointing to some random page. Will be using the app from now to be on the safe side. Just to check – it took about 3 seconds and came back as ‘clean’ is that the right sort of scan time? 3 seconds? Yes, scans don’t take that long. This isn’t like anti-virus software that examines every file on your hard drive… it’s looking for specific things in specific places. Fantastic! Thank you Thomas. My daughter’s month-old MacBook already full of Genieo and InstallMac crap. Your app seems to have dealt with it all. I appreciate your time and effort – and I hope she has learned her lesson! Thomas I sent you a frantic e-mail thanking you personally but this is probably the appropriate place so thanks again for the info on this page and especially AdMedic. Tried to leave a review on the internet but couldn’t find the place (not even Yelp!) What a lifesaver though. You’re doing God’s work. Downloaded your AdMedic and run the program, two or three minutes later list of unwanted rubbish appears, hit the button and a prestos on more pop ups. Top job and Thank You. 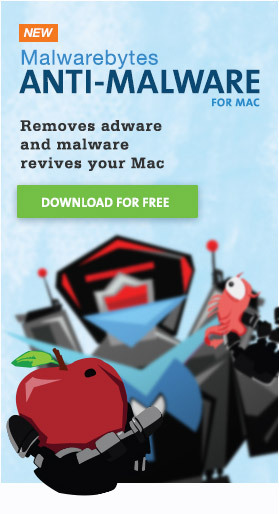 Could you suggest similar adware removal software for my version of OSX ( 10.6.8 ) as Admedic won’t run. Thanks, Jon. Try the manual removal instructions here in my Adware Removal Guide. Thanks for the Easy Fix! Super easy to install and run most important found and cleaned up all the adware. Running OSX 10.9.5 made a donation as well. week worth it. Is there a way to use AdwareMedic for a Time Capsule? I recently installed AdwareMedic so all of the viruses etc that were on my Macbook Pro are now on my Time Capsule. Any solution other than scanning the Time Capsule folders with ClamXav? Unfortunately, no. And be aware that you should never scan your Time Machine backups with an anti-virus app! You should never allow any other app, not even the Finder, to modify your Time Machine backups. Only Time Machine should be allowed to make changes, otherwise you run a serious risk of corrupting your backups. One thing you could do is use the Time Machine interface to locate each file removed by AdwareMedic in the backups. (Full paths to those files are found in the log file – choose Scanner -> Open Log File.) Then have Time Machine remove all copies of each of those files. Or just make a mental note if you find infected files to run your scanner as the first order of business after restoring anything from TimeMachine/TimeCapsule. AdwareMedic saved me today. Accidentally download the Trovi browser hijacker from a site that I thought was the garmin connect plugin download site. Got tricked on that one. AdwareMedic cleaned it up with no problems. Thanks Thomas! Im from Brazil and i write in one space here something like use Mackeeper and stay free of pragues and worms so after today i receive one email yours and you say for me uninstall this because in your country have 2 separate class-action lawsuits alleging fraud. Ok i understand what you say, but i´d like to Know more… I read about who are you and i go I’ll give you a chance to hear more about what you have to speak; but I wanted to know more about these scams and how that MacKeeper is really so bad? !! What is concrete about it since I use 1 year and so far have not noticed anything unusual on my mac. Always there was talk about whether it is reliable or not, some say yes others no, but anyone confirm anything, much less claims with more concrete things. I think the software MacKeeper very cool, at least the old version because it has a new development in which I did not like. Yes I bought MacKeeper and am using a while and have realized that it takes more than Virus but windows than mac. For now would have nothing to complain about because the program suite has other very good resources. But since you apparently have good experience in the mac world, I would like to know which antivirus to use it and recommend a good program for cleanups for mac. I am grateful for your attention and wish I could count on your answer. Please sir I have 10.6.8 I cannot figure out how to remove genieo can u please recommend a similar as ware removal tool for my Mac I’m having one of those days I’ve got a million things to do and first up is remove this damn genieo I’m afraid to try the manual removal as it can freeze up my Mac please help anyone???? You can try the older Adware Removal Tool. It is a bit outdated at this point, but should still remove Genieo just fine. There have been almost no changes to Genieo since that tool was discontinued. Just be sure you follow any directions it gives you to the letter! I tried the link to download even donated but no can do. Whats going on with this. Everyone is raving about it but I can’t seem to get it to download. This is the greatest thing since bottled beer! It cured my iMac. This is great. I accidentally installed Genieo last night and I have spent all yesterday night and this morning trying to read up on it and get rid of it. I ‘uninstalled’ it before reading anything about it and though I could not see any obvious signs of it my browser kept redirecting and opening multiple tabs of advertising. Naturally I was reluctant to download ANOTHER programme to fix the problems, but having read all your instructions and realised some of them were too advanced for me and decided that Adware Medic was genuine, safe and effective I downloaded it, backed up my computer and ran it. Super, faster than it was before I downloaded Genieo so who knows what else I had too.